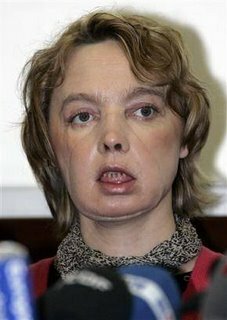 The French Woman with the Face Transplant...Is this a face only a mother would love? While the media plays this as such a huge step for plastic surgery, I believe that it's more the morbid Hollywood fascination about this which attracts most people. Hollywood and the public are fascinated with looking like someone else. That's why the movie Face/Off with John Travolta did so well, and people are fascinated with the "lion woman" who has had WAY too much cosmetic surgery done.